Knee replacement surgery involves removing parts of your knee joint and replacing them with artificial ones. Your doctor may recommend a knee replacement if your joint is painful and has been damaged or worn away. This will usually be because you have arthritis. A knee replacement is an operation to replace damaged parts of your knee. It’s also called knee arthroplasty. Your knee joint is made up of the lower end of your thigh bone (femur) and the upper end of your shin bone (tibia). These normally glide over each other easily because they’re covered by smooth cartilage. But if your cartilage is damaged by an injury or worn away by arthritis, this can make your joint painful and stiff. Artificial knee parts are usually made from metal and plastic. A new knee joint should ease your pain and help you move around more easily, so you can be more active. But your new knee won’t be able to bend quite as far as a normal knee joint. A knee replacement can last for up to 20 years. Over 115,000 people have this procedure each year in the UK. Most people who have knee replacement surgery are in their 60s. There are two main types of knee replacement surgery. 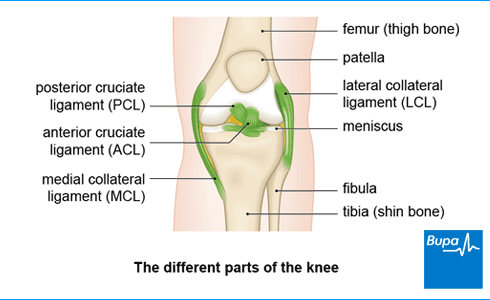 Total knee replacement (TKR) is the most common type of surgery. Your surgeon will replace the lower end of your thigh bone and the upper end of your shin bone with artificial parts. They may also replace the surface under your kneecap (patella) with a plastic button if this is damaged too. With a total knee replacement, you’re less likely to need another knee operation, but more likely to have complications than with a partial knee replacement. Partial knee replacement is called unicompartmental knee replacement (UKR). If you have this type of surgery, your surgeon will replace the ends of the bones on one side of your knee only. This will be because the damage to your knee is only on that one side (usually the inside of your knee). Your surgeon may be able to make a smaller cut than you would need for a total knee replacement. You may also find it easier to move your knee after a partial knee replacement than with a total knee replacement. Your surgeon will discuss which type of surgery is right for you. This will depend on a number of factors, including the condition of your knee, your age and your general health. If you have a knee replacement, you’ll usually be in hospital for around a week. Before you go into hospital, think about how you’ll cope when you get home after your surgery. You may need to arrange for family or friends to be with you for a while to help with everyday tasks, such as cooking, shopping and cleaning. If you can, it’s a good idea to stock your freezer with some cooked meals. Have a look around your home. Make sure there’s nothing you could trip over while you’re less able to move around. And think about where you’re going to sit. Arrange important items, such as your telephone, medicines and TV remote control, so you can reach these easily. You’ll probably be invited to a pre-admission assessment clinic at the hospital a week or two before the date of your operation. A nurse will check to see if you’re fit for surgery. They’ll ask about your general health and fitness and whether you have any allergies. You may have some tests, including blood tests to check for anaemia and to make sure your kidneys are working properly. You may also need to have an ECG (electrocardiogram) to check your heart. It’s important to mention whether you’re taking any medicines (both prescribed by a doctor and bought from a pharmacy), herbal remedies and supplements. You may be advised to stop taking certain medicines before your operation. If you smoke, it’s strongly recommended that you stop. Smoking can make your lungs more sensitive to the anaesthetic and may make you more likely to get an infection after surgery. The nurse may also discuss losing some weight before your surgery if you’re overweight. If you’re having a general anaesthetic, you’ll be asked to follow fasting instructions. This means not eating or drinking before your operation for a specific length of time – it’s important to follow your anaesthetist’s advice. You may be asked to wear a compression stocking on your unaffected leg. This will help to prevent blood clots forming in the veins in your legs (deep vein thrombosis). You may also need to have an injection of an anti-clotting medicine as well as, or instead of, wearing compression stockings. Your surgeon will discuss with you what will happen before, during and after your surgery. If you’re unsure about anything, don’t be afraid to ask. No question is too small. It’s important that you feel fully informed so you feel happy to give your consent for the operation to go ahead. You may be asked to do this by signing a consent form. What are the alternatives to knee replacement? Your surgeon will usually only recommend you have a knee replacement if other treatments are no longer helping to ease your symptoms. These treatments include physiotherapy and exercise, medicines or using physical aids, such as a walking stick. If you’re overweight, your doctor will encourage you to lose weight as this will reduce the strain on your knee. Corticosteroid injections can ease your symptoms for a few months, but this isn’t a cure for arthritis. Alternative surgical procedures include the following. Arthroscopy (if your arthritis isn’t too bad and your knee keeps locking into place) – this is keyhole surgery where your surgeon clears out bits of debris or trims torn cartilage inside your knee. Microfracture – using keyhole surgery, your surgeon makes small holes in the surface layer of your bone to encourage new cartilage to grow. Osteotomy (where your leg bones are cut and re-set) – this is sometimes used if you’re younger, to delay your knee replacement surgery. You may have already had these procedures before your knee replacement. Your surgeon will explain your options to you. Most people have knee replacement surgery under spinal anaesthesia. The anaesthetic will be injected into your spine or the fluid around your spine. It completely blocks feeling from your waist down and you’ll stay awake during the operation. Knee replacement surgery can also be done under general anaesthesia. This means you’ll be asleep during the operation. Your surgeon will make a cut down the front of your knee. They’ll then trim the worn or damaged surfaces from the end of your thigh bone and the top of your shin bone. They’ll shape the surfaces of your thigh and shin bones to fit the artificial knee joint and then fit the new joint over both bones. Your surgeon may also replace the back of your kneecap with a plastic button-shaped part. This is called patellar resurfacing. After your surgeon has fitted the new joint, they’ll close your wound with stitches or clips and cover it with a dressing. Your surgeon will tightly bandage your knee to help reduce any swelling. You’ll need to rest until the effects of the anaesthetic have worn off. You may not be able to feel or move your legs for several hours after a spinal or epidural anaesthetic. Your nurse will give you painkillers to help with any discomfort as the anaesthetic wears off. Always let them know if you’re in pain at any time while you’re in hospital. You’ll have a large dressing on your knee to protect your wound. There may be one or more tubes coming out from your wound through your dressing. These help to drain any fluid that builds up around your wound. The tubes will usually be taken out after a couple of days. You’ll probably be moving your knee again from the day after your surgery. Starting to move your knee within 24 hours after surgery may help you become mobile more quickly and may even help you get home sooner. A physiotherapist (a specialist in movement and mobility) will guide you daily through exercises to help your recovery. You may also use a continuous passive motion exercise machine. This will slowly bend and straighten your knee while you’re in bed to get your knee moving again and reduce any swelling. You’ll stay in hospital for at least five days, possibly up to 10 days, after your surgery. You’ll be encouraged to walk as soon as possible, with the help of sticks, crutches or a walking frame. Your surgeon will want to be sure that your wound is healing well and there are no signs of an infection before you go home. When you’re ready to go home, you’ll need to arrange for someone to drive you there. Your nurse will give you some advice about caring for your knee and a date for a follow-up appointment before you go home. The physiotherapist or occupational therapist will give you tips on how to carry out daily activities, such as using the stairs or washing yourself. The stitches or staples that close your wound will need to be removed after about 10 to 12 days, unless you have dissolvable stitches. This can often be done by a nurse through your local GP surgery. So try to book an appointment for this as soon as you get home. It usually takes around six to 12 weeks to recover from knee replacement surgery. But everyone recovers differently, so it's important to follow your surgeon's advice. Your new knee will keep getting better and stronger for up to two years afterwards. This is because it takes time for the scar tissue to heal and for your muscles to get stronger through exercise. You may be asked to wear compression stockings for several weeks at home or until you’re able to walk around regularly again. Try to build up your daily activities gradually. You should be able to do some of your usual things, such as moving around your home and using the stairs carefully. But you may find some regular activities, such as vacuuming, are difficult for a few weeks. You may need to use a walking stick or crutches for up to six weeks. By six to eight weeks, you may be able to walk, cycle and swim, but check with your physiotherapist first. You should be able to drive between six and eight weeks after total knee replacement surgery. And you may be able to drive again around three weeks after a partial knee replacement. But every situation is different, so follow your surgeon's advice and speak to your physiotherapist when you feel you’re ready. Check your motor insurance too, to see what your policy allows. Before you go back to driving, you need to stop taking any painkillers that can cause drowsiness. You also have to be sure that you can control your vehicle and make an emergency stop. If you work, you should be able to return after about eight weeks, but this will depend on the type of work you do. If you have a physically demanding job, it may be up to 12 weeks before you’re ready. It may help if you do lighter duties at first and then gradually build up to your usual work activities. Everyone, and every job, is different though, so ask your surgeon what they would recommend for you. You may notice swelling of your knee, ankle and/or foot after surgery. This can last for three months or more. Keeping your foot raised, for example on a footstool, can help to reduce the swelling. But remember to get up and have a walk around for five minutes every hour to reduce your chances of developing a blood clot. You can also try putting an ice pack on your knee, but don’t put this directly onto your skin. You may need some kind of pain relief for up to 12 weeks after your operation. Some people have discomfort for up to six months. If you feel you need pain relief, speak to your GP about this. Physiotherapy exercises are an essential part of your recovery. If you don’t exercise your knee gently and regularly, it may feel stiff. Keep doing the exercises your physiotherapist has recommended. After around six weeks, you may be able to walk without a stick or a crutch. Don’t sit with your legs crossed for the first six weeks. After three months, you can try kneeling using a soft cushion. Kneeling shouldn’t damage your knee but you need to wait until the scar tissue has healed enough. Some people find that kneeling never becomes completely comfortable after knee replacement surgery. Most knee implants aren’t designed to bend as far as a normal knee. Don’t worry if you feel tired and a bit emotional for a while after your surgery – this is normal. You’ve had a major operation and your body needs time to heal and recover. After knee replacement surgery, you may have some temporary side-effects. Pain – you’ll probably have some pain or discomfort in your knee. This is normal in the first two months after your surgery. The pain may last for around 12 weeks, but sometimes up to six months. If you’re finding it hard to ease your pain with painkillers or if it gets worse, see your GP. Swelling – it’s normal to get mild to moderate swelling of your leg for the first three to six months after surgery. This can affect your ankle and foot. If you notice new swelling, or bad swelling, tell your GP as you may be developing a blood clot. Scarring – you’ll have a vertical scar over the front of your knee, probably about 10 to 18 cm (4 to 7 inches) long. You may not have any feeling in the skin around your scar for a while. This can be permanent, but should get better over two years. Weakness – your leg may feel weak at first. But it will get stronger as you start exercising your muscles on the advice of your physiotherapist. Most people also feel or hear some clicking of the new implants in their knees when bending or walking. This is normal and you’ll probably get used to it over time. Most people don’t get serious complications after knee replacement surgery. But complications may include the following. Blood clots – you could get a blood clot in the veins in your legs (deep vein thrombosis, DVT). These clots can break off and travel to your lung (pulmonary embolism), which can be very serious. You should be able to prevent blood clots by wearing compression stockings, staying active and taking blood thinning medicines. Infection of your wound or joint – your surgeon will give you antibiotics during and after surgery to help prevent this. Very occasionally, you may need more surgery to clear up an infection. An unstable joint – your knee joint may become loose or your kneecap may become dislocated. You need to have surgery to fix this. Damage to nerves or blood vessels – this usually gets better on its own, but sometimes you may need surgery, especially if blood vessels are involved. Stiffening due to scar tissue – the stiffness may carry on or increase after surgery, as scar tissue builds up and restricts your movement. This can usually be treated with physiotherapy but it’s possible you may need more surgery. Most knee replacements last for at least 10 to 15 years. Many of them will last for as long as 20 years. Total knee replacements tend to last a little longer than partial knee replacements. How long your joint implant lasts will depend on many different things, including your age and lifestyle. You’re more likely to need another knee replacement in the future if you’re overweight or do heavy manual work. You’ll have an X-ray on your knee to check your knee implant at some point after the operation, possibly after one year. You may have more depending on what your surgeon recommends. If your replacement joint is loosening or breaking, you may need another operation to fix this. If you need another knee replacement on the same knee, this is called a revision. Are there any sports or activities I shouldn't take do after my knee replacement? After the first six to eight weeks following your surgery, you should be able to go walking, swimming or play tennis, for example. But build up your activities gradually and, if you’re swimming, don’t do breast stroke as this puts pressure on your knees. You’ll also need to avoid any high-impact exercises, such as running or heavy lifting. It’s natural to worry that you’ll damage your new knee joint, but sensible exercise will help to strengthen your knee and keep you active. After surgery, your physiotherapist will recommend exercises to improve your strength and range of motion. Using an exercise bike may help too. Once you’re fully recovered, you should be able to take part in many sports and activities. But this will depend on how fit you were before your surgery and how easily you’ve recovered. You may find that you can’t do your chosen sport at the same level as you could do before your knee replacement. Your surgeon may recommend that you don’t do any high-impact exercises or contact sports, which can weaken your new knee joint. These include tennis, running, squash and skiing. But you may be able to do activities such as dancing, cycling and golf. Ask your surgeon and physiotherapist about the sports and activities you want to do, to see whether these are suitable for you. How can I make my recovery easier? If you’re having a knee replacement, it's a good idea to try to be as fit and healthy as possible before your operation. This will help to speed up your recovery. If you have any long-term health conditions, such as diabetes, make sure these are well controlled. If you smoke, try to stop, because smoking makes you more likely to have an infection after surgery. Speak to a local pharmacist or your GP about the best way to stop smoking. If you’re overweight, your doctor may recommend a weight-loss programme to reduce the strain on your new joint. Think about preparing your body with some exercises too. Strengthening the muscles at the front of your thighs around your knee will speed up your recovery. Your surgeon or physiotherapist will be able to recommend exercises for you. It's also a good idea to get your home ready for when you leave the hospital. This may mean rearranging your furniture so you’ll find it easier to move around when you get home. Place items you use regularly at arm level so you don't have to reach for them. You could also stock up on non-perishable food such as frozen or tinned items, and toiletries, as well as freezing some cooked meals in advance. This means you don't need to go shopping straight after your surgery. You may need someone to help you during the first few weeks while you recover. A friend, family member or neighbour may be able to stay with you for a couple of days after your operation. When can I fly after knee replacement surgery? It may be best not to fly abroad, especially long haul, for at least 12 weeks after knee replacement surgery. But talk to your surgeon if you’re planning any air travel to find out what’s right for you. After surgery, you’re at a high risk of getting a blood clot in your leg (deep vein thrombosis). A blood clot can become serious if it breaks off and reaches your lungs pulmonary embolism. Your surgeon will prescribe anti-clotting medicines and give you compression stockings to wear, sometimes for several weeks. Sitting in one position for a long time, such as on a flight, makes you even more likely to get a blood clot. Even if on a short flight, you should wear compression stockings. Your artificial knee joint may set off airport security scanners. If the alarm goes off, the security officer will usually do a pat-down search. The airport scanner won’t damage your knee implant, but do tell the security officer about your knee replacement before entering the scanner. It may help to carry a letter from your doctor (they may charge you for writing this) or wear medical alert jewellery confirming you have an artificial joint. What are knee implants made from? When you have a knee replacement, your surgeon will use artificial parts called a knee implant. There are over 150 different knee implants available. The most common designs are made from metal (titanium or stainless steel) and plastic (ultra high-density polyethylene). Knee implant designs vary in which parts are connected together and how the implant is held in place. Most total knee replacements use metal parts that are fixed to the bottom of your thigh bone (femur) and upper end of your shin bone (tibia). Between the metal parts, there’s a hard-wearing plastic tray. The tray may be attached firmly so that the metal rolls across it, called a fixed bearing implant. Or you may have a mobile bearing implant, where the plastic is fixed less firmly, so your new knee joint can rotate slightly. You may also have a plastic implant inserted under your knee cap (patella). A complete artificial knee weighs about 500 to 600 grams (18 to 21 ounces).Your surgeon will usually fix your knee implant in place using a fast-setting bone cement (polymethyl methacrylate). But some implants have special textured surfaces so they don’t need any cement – the new bone grows into them to hold them in place. These are called cementless implants. Ask your surgeon to explain which type of implant would be best for you. The type of knee implant you have will depend on many things, including your age, weight, level of activity and health.